The temple was primarily dedicated to Isis but her husband Osiris and her son Horus were also worshipped there. Both Isis and Osiris are seen as deified rulers and so their names appear within a cartouche. The current Temple of Isis is a notably Ptolemaic structure. The main body of the building was built by Ptolemy II, (behind the ancient shrine of Amasis which was then demolished). To the north of the Kiosk of Nectanebo, there are two colonnades leading towards the first pylon of the Temple of Isis. The western colonnade is in better condition and still retains some of the original which used to offer a view of the island of Biggeh. It is around 90 metres (100 yards long) and thirty-one of the original thirty-two columns remain. Although all of the column capitals are floral, no two are exactly alike. Many of the columns depict Roman Emperor Tiberius making offerings to the gods, and there are two rows of bas-relief depictions of Tiberius and Augustus in the rear wall. The remains of the decoration of stars and vultures can still be seen on parts of the ceiling. At the north end of the western colonnade, there is a nilometer cut into the cliff. The eastern colonnade was never completed. 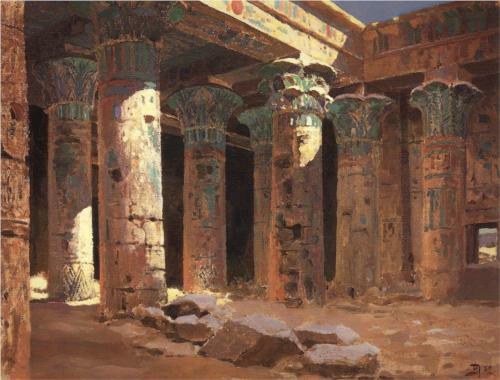 At the south end it is attached to the small temple of Ary-hes-nefer (Arsenuphis or Anhur). The Gate of Ptolemy II Philadelphus lies between the Temple of Imhotep and the first pylon of the Temple of Isis. The gate is decorated with images of the Pharaoh being led forward by Isis. The gateway was constructed by Nectanebo and so predates the rest of the first pylon. Nectanebo makes an appearance with a number of gods, but there are also post dynastic inscriptions on the gateway. Coptic Christians cut a number of crosses into the stone, and a French inscription records over the Mamelukes in 1799. The first pylon consists of two 60 foot towers with a gate between them. There are grooves cut into each side of the pylon to support flag poles. Construction of the pylon was begun by Ptolemy II Philadelphus and finished by Ptolemy III Euergetes I, but decorations were also added by their successors. Ptolemy XII Neos Dionysus is depicted on the eastern tower holding a number of enemies of Egypt by the hair while holding his mace high above his head in the traditional "smiting" pose. He is accompanied by Isis, Horus of Edfu and Hathor. There are two smaller scenes above this depiction; on the left the pharaoh offers the crown of Upper and Lower Egypt to Horus of Edfu and Nephthys; and on the right he offers incense to Isis and Horus the child. The pharaoh is also depicted "smiting" his enemies on the western tower in the presence of Isis, Horus of Edfu and Hathor. Above this scene the pharaoh appears with Unnefer (or "wennefer" a form of Osiris) and Isis and also with Isis and Horus the child. These decorations were badly damaged by early Coptic Christians. At the base of the first pylon a series of small personified Nile figures present offerings. The First Pylon leads to an inner courtyard in which the Mammissi of Isis is located (on the west). On the eastern side of the courtyard there is a colonnade with access to a few small storerooms and in the north the Second Pylon provides access to the main structure of the Temple of Isis. Behind the colonnade on the eastern wall of the courtyard there are five storerooms, each two stories high. Some of these rooms may have been used as storerooms and one at least seems to have been a library while another was used for storing and mixing the precious oils and incenses used in the temple. However, it is also suggested that they were used for ritual purification rites. The birth-house is surrounded on three sides by a colonnade of floral topped columns each crowned with a sistrum and Hathor-headed capital. The walls flanking the columns depict the pharaohs Ptolemy VI, VIII and X and the Roman Emperor Tiberius along with a number of gods. The Mammisi (birth house) was a common feature of Ptolemaic temples and the examplke on Philae is similar in layout and decoration to examples at Dendera and Edfu. In the sanctuary of the mammisi of Isis, Horus is depicted as hawk awearing the Double Crown and standing in a thicket of papyrus. Below that scene, Isis carries the newly born Horus in her arms, under the protection of Thoth, Wadjet, Nekhbet and Amun-Ra. The second pylon is approximately 105 foot wide and 40 foot high and (unusually) is not set parallel to the First Pylon. A series of small steps lead to the gateway between the two towers. On the western tower, Ptolemy XII offers incense and animals to a number of gods including Horus, Hathor. There are two scenes above this which have unfortunately been quite badly damaged. One depicts the pharaoh offering a garland of flowers to Horus and Nephthys , the other depicts the king offering incense and pouring cleansing water on an altar in the presence of Osiris, Isis and Horus. A staircase in the western tower leads to the roof and the "Osirian Chambers". The eastern tower has very similar decorations but is in much better condition. Both towers have grooves for flagpoles just like those on the First Pylon. Ptolemy VIII Euergetes II and a number of gods make an appearance in the decorations on the passageway between the towers, but unfortunately the depiction has been quite badly defaced. On the east side of the doorway there is a later inscription dedicated to the Christian Bishop Theodorus. Near the base of the eastern tower, a piece of the granite foundation of the original island protruded from the ground (and has been moved to the new island). Ptolemy VI Philometor had this outcrop of granite carved into a stele on which he appears with queen Cleopatra II standing in front of Isis and Horus. The inscription refers to the grant of land to the temple which placed the priests of Philae on a similar standing to those of Elephantine. The grant is known as the "Dodekaschoinoi" which is Greek for "twelve schoinoi" (in which a "schoinos" is a piece of land around seven miles along the riverbank). The gateway through the Second Pylon leads to a small open court and hypostyle hall. There was originally a colonnade on the east and west sides of the courtyard, but only ten columns remain. The pillars are beautifully painted and decorated to resemble a variety of plants and flowers. They are though to represent the first plants that grew from the primeval mound. The ceiling of the hypostyle hall is decorated with the twin vulture goddesses Nekhbet and Wadjet (representing upper and lower Egypt) and the barques of day and night. A number of reliefs in the courtyard have been defaced and replaced with Coptic Christian crosses and a Christian altar was erected in the courtyard at about 500 AD. There were, in fact, several Christian churches here, including those dedicated to the Virgin Mary (usurping Isis) and Saint Stephen (usurping the position of Horus. There is also another inscription by Bishop Theodorus on the doorway of a room on the right of the hall in which he takes credit for his "good work" in defacing the ancient monument. A similar inscription records the "archaeological" expedition sent by Pope Gregory XVI of 1841 during which further ancient reliefs were no doubt destroyed. There are three small antechambers with small rooms set off them and then the sanctuary itself. The sanctuary is a small chamber with two small windows. It still contains the pedestal installed by Ptolemy III Euergetes I and his wife Berenice which would have supported the image of Isis in her sacred barque. This statue of the goddess would have been carried out in processions from the temple on her ceremonial barque to make the short crossing to the island of Bigeh to visit the tomb of her husband, Osiris.